FA is seeking an explanation from Pep Guardiola regarding his comments about referee Anthony Taylor prior to last weekend’s Manchester derby, British media reported Monday Manchester City coach, Pep Guardiola Manchester City boss Guardiola did not appear to say anything controversial or critical about the official but the FA, English football’s governing body has made it clear previously it would prefer managers not to make any public comment at all about referees. Taylor, hails from the Manchester suburb of Wythenshawe, near Manchester United’s Old Trafford ground. That led some City fans to question his impartiality ahead of Sunday’s match at the Etihad Stadium. But the Premier League have long been happy happy to let Altrincham fan Taylor handle some of the division’s biggest games. 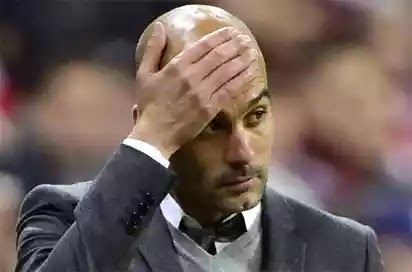 “He is going to try to do the best job, like we try as managers and football players,” said Guardiola when asked about the referee at his pre-match press conference “Mr Taylor is going to try to make a good time. I don’t think too much. The important thing is to focus on our game, of course knowing which opponent we are going to face, and that’s all. “Hopefully they can make good decisions for both sides and (it will) be a good game — all England, all parts of Europe are going to watch us, that is the most important pleasure. “The referee doesn’t want to make a mistake but he knows everybody around the world is going to watch him. He doesn’t want to make mistakes, that is pretty sure. “But if he is a fan of United or City? Anybody can be a fan of whoever he wants. No problem.” None of Taylor’s decisions proved controversial in a match City, the reigning Premier League champions, won 3-1 to return to the top of the table.